Almost a year after his death, Robin Williams stars in his final role as a closeted gay husband coming to terms with his sexual identity at the age of sixty. Currently scoring 51% on Rotten Tomatoes, the film is being noted for William's performance as a sad, depressed character as a parallel to his own life. 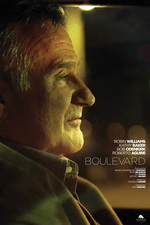 The movie, in terms of plot and direction is being described as "average", but the historical place of Boulevard in the career of Robin Williams is ensuring attention. Nick Allen, Roger Ebert.com: ""Boulevard” has the unfortunate mark in history as being the last on-screen appearance for Williams, and it provides the ending to his on-screen life that tragically doesn’t parallel that of his off-screen one. His soulful work here leaves his career feeling very incomplete; for a few more misguided film choices that he might have made, as popular entertainers always do, there would also be some very special performance vehicles, as with "Boulevard."" Sheri Linden, LA Times: "A year after Williams took his life, his tormented portrayal of a man facing an empty existence has unavoidable resonance beyond the movie's frame. "Boulevard" finds a hopeful resolution, but what lingers is the sense of a light extinguished. " Mick LaSalle, SF Gate: "To watch “Boulevard” is to keep circling back, over and over, to the question: Was it merely an actor’s misguided inspiration, to take a repressed character and turn him into a grievously depressed one? Or was Williams simply unable to do it any other way? " Cultured Vultures: "No movie should have to live up to the standards of being the final chapter to a talent’s extraordinary career. Boulevard will not be considered a classic in five years’ time. It won’t even be considered to stand amongst the best of Robin Williams. However, purely from a career point of view, Boulevard allows us two things. It lets Williams go out on a relative high note (because let’s keep in mind that Boulevard isn’t awful, so much as it’s just very ordinary). In giving Williams one more opportunity to show us that his skills as an actor never left him, and that he was capable of bringing sincere pathos to a bland script, Boulevard also allows us to say goodbye."